Ever the great raconteur Duke Ellington once described (to Stanley Dance) the making of good music as akin to cooking a fine dish, which is to say: you have to add only the finest ingredients, cook to perfection and serve with finesse. There are many fine recordings that would meet this description. 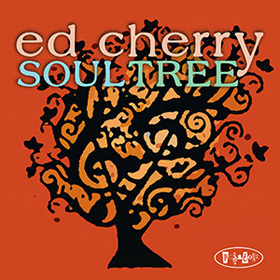 This 2016 recording by Ed Cherry – Soul Tree – is most certainly one of them. If one word were to be used to describe in a nutshell what it’s like, that word would certainly be – taking a leaf from Ellington’s book – ‘delicious’. In Cherry’s voluptuous guitar lines, in the mighty growl of Kyle Koehler’s organ and in the fascinating rhythm of Anwar Marshall’s drums, you have the finest ingredients… the rest as they say is history. But, of course, there is much more. Ed Cherry cut his proverbial teeth with Dizzy Gillespie’s mighty United Nations Orchestra. He played in that ensemble from 1978 to 1993 where he refused to be just part of the rhythm section. In fact there is some fine music out there – not on record, unfortunately – where Gillespie shone the spotlight on his young protégée. But Cherry is also something of a musical chameleon. 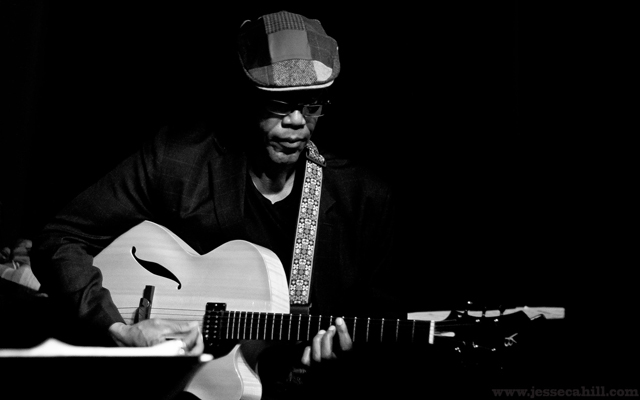 While he played rock-steady jazz and has been around the block with that kind of repertoire, he also pushed the envelope; inhabited the edges, so to speak, with Henry Threadgill and Hamiet Bluiett, to name just two of the New Thing’s superstars. On this recording, Soul Tree Ed Cherry returns to standard repertoire. But old habits die hard and Cherry shows once again that he will not be a standards guitar player. There’s visceral rhythmic excitement in this performance by the trio. The language of the music is literally lifted off the page when they play. Long-limbed repertoire such as Mal Waldron’s Soul Eyes, Freddie Hubbard’s Little Sunflower, John Coltrane’s Central Park West and Horace Silver’s Peace form the spine of this performance. Performances have a wonderful, flexible sense of timing. Cherry floats exquisitely limpid lines in the graceful, contrapuntal Central Park West, for instance, allowing it effortlessly to unfold. The always sensitive Koehler brings his velvety sound to this piece while Marshall is warmly spontaneous, unleashing ardent rhythmic figures to the melody without a fuss. The three musicians together bring a huge range of tonal colour to this chart as well as to the other material on the album. Cherry and Marshall also share a supple rhythmic flexibility on Dave Brubeck’s In Your Own Sweet Way. The opening is big-boned and generous, with a sense of depth and spaciousness that gives the piece an almost orchestral scale – with generous help from Koehler, of course. Cherry’s own composition Little Girl Big Girl is no less exciting, with all three musicians diving headlong into its development with more than a generous hint of abandon. As a result of all of this the song is powerfully and lovingly delivered. Still, an overall glistening delicacy is added to the power of the instrumental delivery and this remarkable variation of character is what makes this disc so memorable. Delicious? There seems hardly a better word to describe this performance when all is said and done. Ed Cherry, Kyle Koehler and Anwar Marshall have dished out a fine stew indeed. Track List: Let the Music Take Your Mind; A New Blue; Rachel’s Step; Soul Eyes; Little Sunflower; Central Park West; Little Girl Big Girl; Ode to Angela; In Your Own Sweet Way; Peace. Personnel: Ed Cherry: guitar; Kyle Koehler: organ; Anwar Marshall: drums.